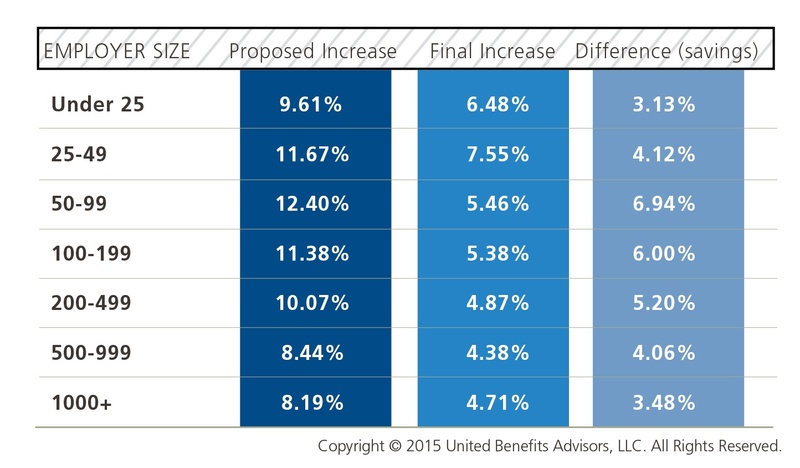 Employers in states that allowed “grandmothering” – the extension of non-ACA-compliant plans – are now seeing proposed health plan rate increases of 11 percent, on average, according to the 2015 United Benefit Advisors Health Plan Survey. Many employers, particularly small to mid-size, are still delaying the effects of the Affordable Care Act (ACA). Seventy-three percent of plans in the survey have a renewal date on or after December 1, 65.4% of which were small businesses in the fewer than 100 employee market. Employers in the under 50 employee market saw a 2.1 percent increase in renewals after December 1, 2015, compared to 2014. On average, employers this year saw only a modest 2.4 percent increase in annual health plan cost per employee. As a result of the Patient Protection and Affordable Care Act (ACA) triggering cost increases for fully insured employer-sponsored health insurance plans, more employers are moving to a self-funded model for pharmacy plans, particularly among large employers (1,000+ employees), according to data released from the 2014 United Benefit Advisors (UBA) Health Plan Survey.